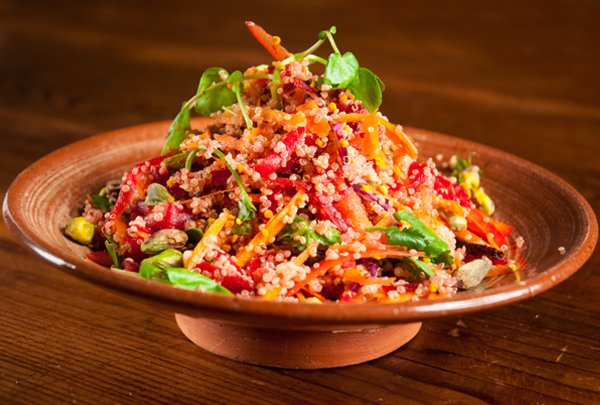 The Peruvians rightly called quinoa (pronounced KEEN-waa) the food of the gods. Everything about it is amazing – nutritious, tasty, plentiful, filling, oh you gorgeous little grain! It’s a dream for coeliacs and vegans too and I love my quinoa mixed with just about every healthy nutritious tasty thing under the sun – and still keep it vegetarian! So, I’m to going to keep ranting and raving, I just think that you should go out and get some quinoa and crack on with this recipe that will make you very happy, nourished and satisfied! Bring a pan of water to boil and cook the quinoa according to the instructions on the packet. (basically, dunk it in boiling water, wait for it to ‘open’, drain)! Heat a little oil in a pan and add the whole spices. Fry the spices for a few seconds, then add the butternut squash. Add the garlic and courgettes and cook for another 10 minutes. Add the red onion, raisins, chilli and quinoa. Mix in the lemon juice and salt, put a lid on the pan and set aside. Peel and grate the beetroot and the carrot and mix in with the quinoa along with the herbs. Quinoa goes on the plate, with the almonds sprinkled on top and a nice side salad! Easy as that! If you’re a die hard carnivore, this goes lovely with a bit of chicken or salmon!